Last updated Jan 30 2008 - see bottom post for more. 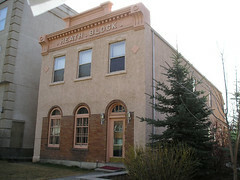 The Heath Block is at 615 15th Avenue SW. Originally the high-end tailor shop of Fred Heath, the first floor was converted to residential around 1930. 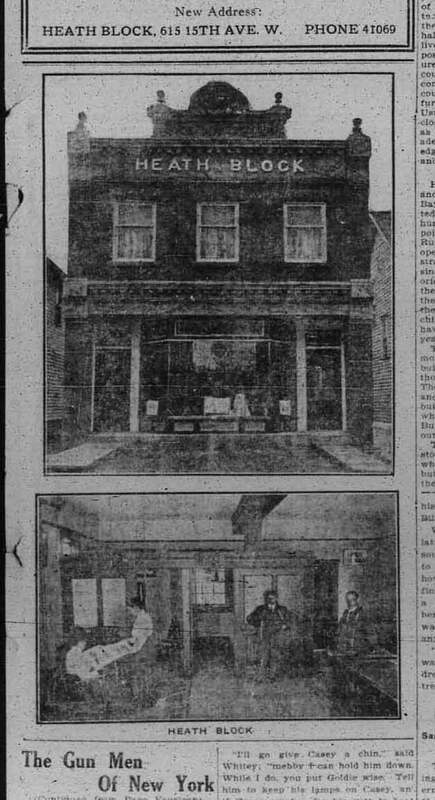 The newspaper photo below is from a 'grand opening' advertising feature in the Calgary Daily Herald, August 24, 1912. Calgary Daily Herald, 10 Aug. 1912. Other information: Heath's partner for a time was Robert Harold (R.H. Williams), who set up his own ladies ready-to-wear store in 1921. In 1928 he built his own store a block east at the corner of 15th Avenue and 4th Street, which remained an R.H. Williams store until the late 1990s. Now the Haycock Chiropractic Clinic. Source: Harry Sanders Historic Walks of Calgary, p. 246. Heath Block still for sale. There is presently an application in to the City to add office uses, which is common for historic buildings in the Beltline. The change of use noted above, to allow office, did pass. The Heath block is again up for sale as of November 2009.